I remember being very worried about only two things as a 10-12 year old boy. The first was the belief that we would all be switching over to the metric system and I would have to relearn all things related to measurement. The second thing that preyed upon my young mind was the impending and inevitable arrival of Africanized “killer” bees. Producer/director, and master of the disaster movie, Irwin Allen chronicled the coming bee apocalypse that would soon be upon us in the United States in the 1978 movie The Swarm. While tame by today’s standards, the movie made quite an impression on me. I paid close attention to any killer bee news stories on television or in the newspapers after seeing it. As time went on I realized that my fears had been unfounded. We were not converting to the metric system and the bees were not coming to kill us all. We were safe. While not nearly as dramatic as the huge swarming menace depicted by Irwin Allen in his film, and almost 40 years later than predicted, Africanized bees have arrived in Texas and they are causing problems. As a matter of fact, they are practically in my own back yard. The danger was highlighted by a couple of incidents here in Central Texas over the last couple of months. On Monday, August 26, a Waco man was taken to a local hospital after being stung dozens of times by bees he accidentally disturbed while mowing his lawn. The man will recover and authorities dispatched a beekeeper that found the hive about 30 feet off the ground in a large tree. The beekeeper destroyed the nest. Authorities said the attackers were identified as regular honeybees and could not say why they reacted so violently. I’ve since heard rumors that this identification might have been premature but have not seen anything official. While the identity of the attacking bees in the Waco attack may still be up in the air, there is no doubt as to what type of bees attacked and killed a Moody man back in June. Larry Goodwin was riding on his tractor when he came across a hive of Africanized bees in an old chicken coop. Their attack was swift and merciless. Goodwin was stung more than 1,000 times and died at the scene. His wife and daughter, who rushed to his aid, were each stung about 100 times each. Local beekeeper Allen Miller was called in to remove the hive and said he’s seen more Africanized bee hives in the past few weeks than he normally sees in a year. In July of this past summer a swarm of killer bees attacked and killed two horses and severely injured two adults near Pantego, TX. According to the owner, her two horses were, “so covered in bees that they shimmered,” before they were overcome and collapsed. The owner and her boyfriend were stung upwards of 200 times when they tried to intervene and help the horses. Pantego is in Tarrant County near Arlington. There are other, less recent, attacks, too. They range from the south Texas Rio Grande Valley to north Texas along the Red River. The killer bees are not getting the press that they used to; I guess the media squeezed every last bit of mileage from this topic years ago. Don’t let that fool you though as the Africanized bee is here to stay. Killer bees are actually hybrids produced by the cross breeding of African honeybees and various Western honeybee species. 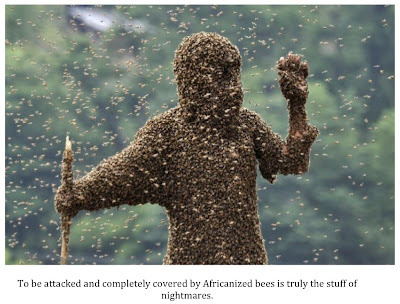 It is thought that Africanized bees in the Western Hemisphere are the direct descendents of Tanganyikan queen bees that were accidentally released by a replacement beekeeper in Brazil back in 1957. The Africanized bees are much more aggressive and tend to drive out and overrun native bee species. The Africanized bees are now actually the dominant type of honeybee used for beekeeping in Central and South America. They are prolific in this regard* but this is often offset by the fact that collection of honey is made much more difficult by the super aggressive nature of these bees. - Tend to swarm more frequently and fly farther than other types of bees. - They are more likely to migrate seasonably in response to poor food supply. - They are more likely to “abscond”- the entire colony leaves and relocates in response to stress. - They are more defensive when in “resting swarm” than other honeybees. - Live in ground cavities more often than other honeybees. - Guard their hives more aggressively than other types of bees and have a larger “alarm zone” around the hive. - Have more guard bees in their population compared to other species. - Deploy in greater numbers for defense and pursues much longer than other species of bee. Africanized bees have spread from Central America and into the American Southwest and South. By 2002, they had been found in California, Arizona, New Mexico, Texas, Louisiana, and Arkansas. Recent events seem to indicate the bees continue to spread. In 2010, a 73-year–old man was killed by Africanized bees while clearing brush on his property in southern Georgia. In 2012, beekeepers located a hive of killer bees in Monroe County, Tennessee. 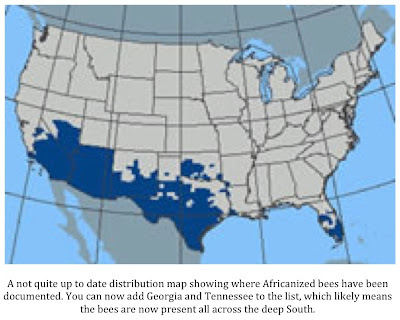 It has long been assumed that Africanized bees would likely become a hazard in southern states but not spread too far north because they can’t tolerate the cold winters. That is being questioned now as, much like another invasive, the Burmese python, the bees are proving to be more cold tolerant than anyone would have ever guessed. It turns out that my childhood fear of killer bees was not completely unfounded after all. I just hope that the metric system doesn’t make a comeback, too. *I've actually seen conflicting reports about how prolific Africanized bees are when it comes to making honey. Some sources I've come across state they don't make much wax or honey while others say the opposite. I would welcome being enlightened by someone with more knowledge on this subject. When I first started this site I figured that I would end up discussing wood apes more than anything else. While it is true that these mystery primates are discussed quite frequently here, I have been mildly surprised that over the years that I have received far more emails, texts and comments about sightings of a different mythical creature. Like the wood ape, this animal is not supposed to exist. Still, sighting reports continue to pour in on a weekly basis. The animal in question, as long time readers have surely guessed by now, is the black panther. 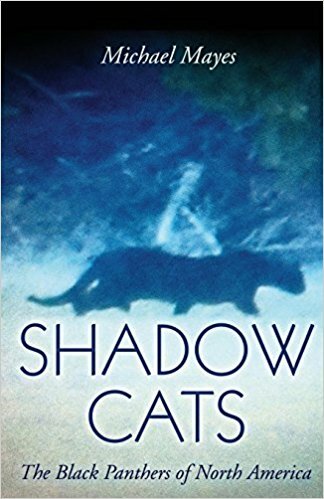 Following are messages I’ve received from readers over the last few months detailing encounters with these anomalous big cats. As in the past, most of these reports have come to me in the form of anonymous comments in response to posts I’ve made on the subject. That being the case, I’ve been unable to follow up on most of these sighting reports. I cannot absolutely say that each one of these folks who’ve taken the time to write a comment or send in a message is telling the truth or didn’t misidentify some other known species but the stories are quite fascinating. The following are the reports I’ve received over the last few months exactly as they were sent to me. TCH Comment: While this is not a sighting report per se, this reader does bring up an interesting fact. Many geographical features in the state of Texas have names that imply they were named after real creatures that live/lived in the area. Some of these creatues are not supposed to exist. There are numerous examples; Panther Creek, Black Cat Ridge and Hairy Man Road just to mention a few. - Vester Skiles Austin, Tx. TCH Comment: This entire eastern part of the Lone Star State is rich with tales of screaming black panthers. This sighting is unique in that it involved cubs. This is only the second sighting of which I’m aware where young cats were also sighted. TCH Comment: This is one of those sightings that falls into the “tweener” category. It is too small to absolutely rule out a bobcat (the color would be right though the presence of a tail would not be) as the culprit and too large for a jaguarundi. The witness fails to mention the time of day when the sighting took place so I must assume that a dawn/dusk and/or nighttime encounter is a possibility. If so, then low light conditions could have made determining the color of the animal a bit more tricky. TCH Comment: I would like to hear more about this first hand account of a horse kill. I’m assuming “first hand” means someone actually witnessed the attack? Please contact me via email at Texascryptidhunter@yahoo.com and we can set up a time to visit. TCH Comment: I get a lot of reports from the Conroe area. While highly populated, Conroe is adjacent to the Sam Houston National Forest from which many reports of big cats and other weird goings on originate. TCH Comment: Spring, TX is basically just a continuation of Conroe which, as has been previously mentioned, is an area from which I receive many reports. This report could be one of mistaken identity. Obviously, I was not present but the dimensions described, if off at all on the small side, could point to a large domestic/feral cat. 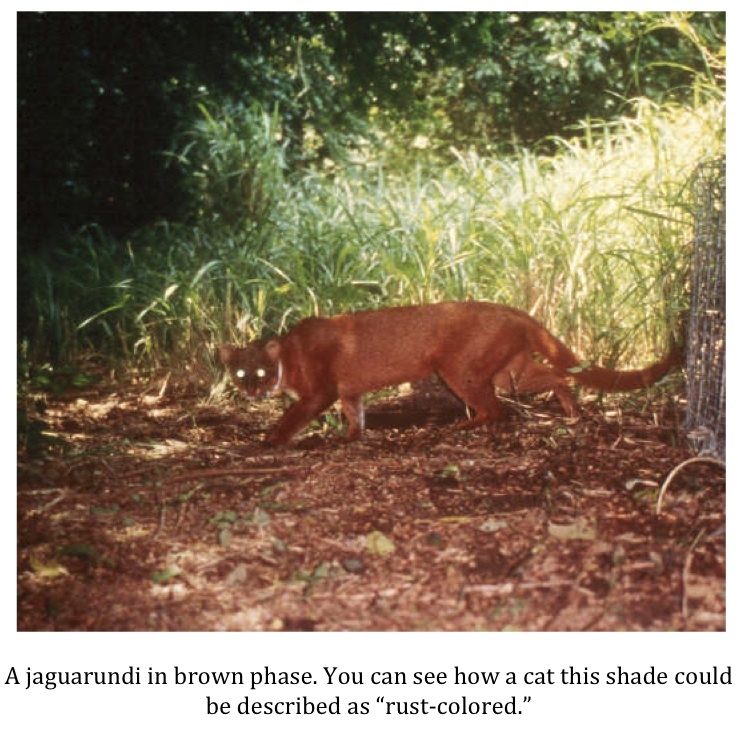 The dimensions and color, if accurate, could point to a jaguarundi as the culprit though these weasel-like cats are not supposed to live so far north. TCH Comment: Precious little to go on here. The witness fails to mention where he was when the alleged sighting occurred. The witness does strongly assert that he has no doubts the cat he saw was a black panther so I assume it must have been a large animal. 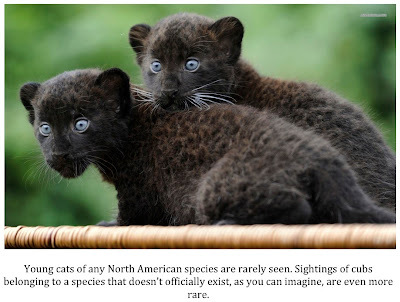 TCH Comment: I’ve never really subscribed to the melanistic jaguar as the creature behind most black panther sightings. After all, while not uncommon, melanism in jags is still the exception rather than the rule. That being the case, if people were seeing jaguars then the much more common spotted individuals should be reported much more often than solid black cats. In this case, however, a melanistic jaguar seems the most logical choice. While Llano County is centrally located in Texas there really isn’t too much between it and Mexico. Lots of open country and relatively lightly populated areas. Llano County sits close to what would be considered the Texas Hill Country, too, which has generated quite a few black panther sightings. The ocelots would be a great find. They are not thought by most to get much farther north than the Rio Grande Valley and they are very rare even there. “I was inspired by this article to revisit a sighting I had on the Little River National Wildlife Refuge in southern OK in September 2009. Ironically, I guess, I was in the area to attend the Texas Bigfoot Conference; this was a "field trip" on the first day of my stay. An animal that looked like a cat, rust-ish colored, crossed the road, quickly, in front of my car. After it entered the woods I never saw it again. I would have thought bobcat, but for the long tail. Cougar, no way. Canid, no way. (Domestic cat: NO WAY.) I got absolutely no look at the head (when first seen the animal was quartering away from me; this, to me, seems to indicate a small head). TCH Comment: This witness seems to have answered his own question. 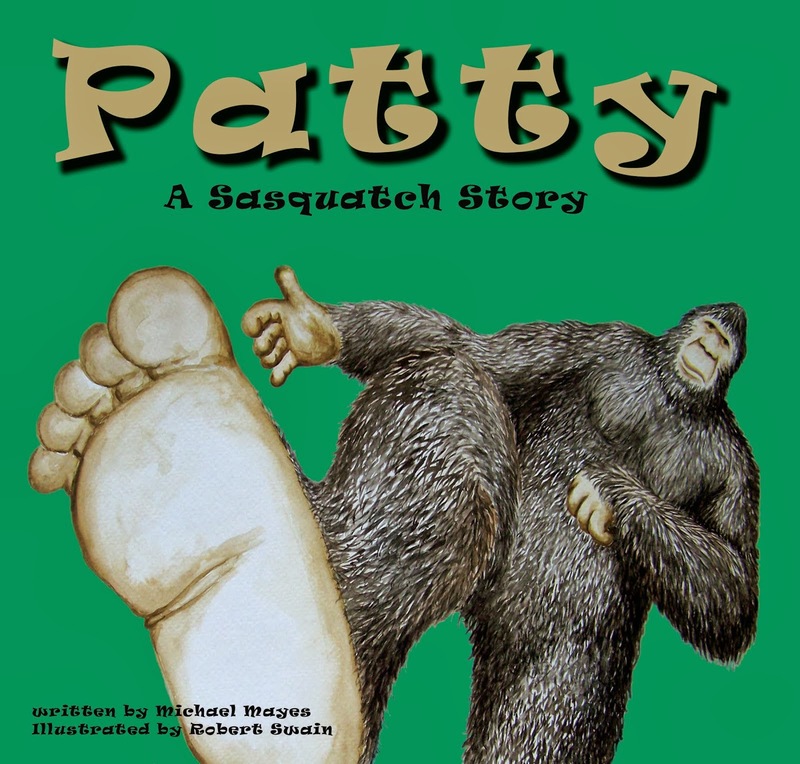 No surprise since he was intelligent enough to attend the NAWAC’s annual Texas Bigfoot Conference, haha. In all seriousness though, a jaguarundi as far north as Oklahoma would be quite a story IF we could prove it. 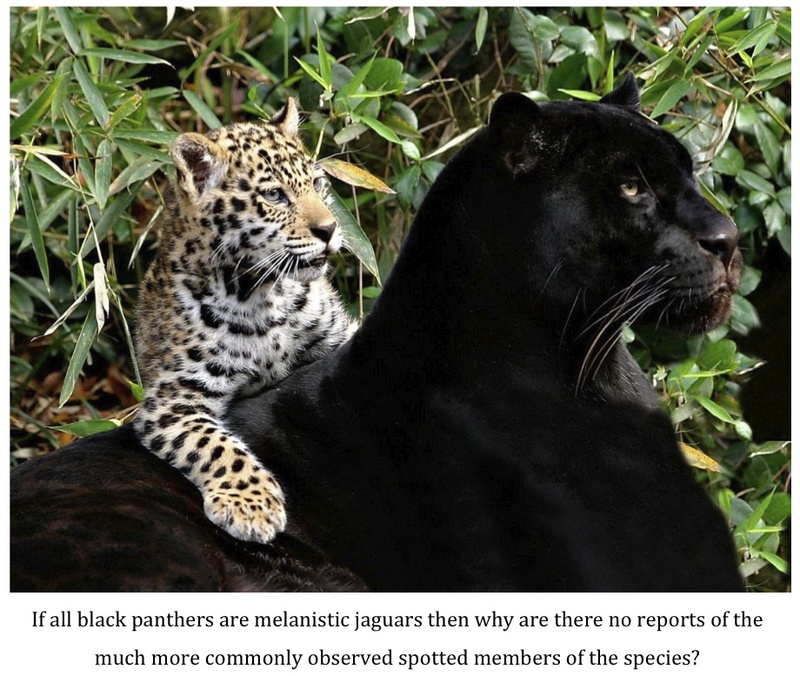 TCH Comment: Donna’s description sure matches that of a melanistic leopard or jaguar. Surprisingly, a very high number of sightings originate in north Texas. This includes many sightings from the Dallas/Fort Worth area. TCH Comment: Many might dismiss this witness because he has had “too many” encounters. That could be a mistake, I believe. The areas where he claims to have lived are rich in sightings of the very animals he describes. Add that he is a science teacher and you have a witness who likely is a little more aware of wildlife and what is supposed to live where than another citizen. TCH Comment: Another jaguarundi sighting. While not a true cryptid, a jaguarundi would definitely be considered out of place as far north and inland as New Braunfels. TCH Comment: Very matter of fact type of report. The list of big cat candidates that can measure four feet in length head to tail and be black in color is pretty short. TCH Comment: The report of a long bushy tail is interesting and unique. “Bushy” is not a term usually associated with cat sightings. Could this have been a canid of some kind? Either way, if the animal was as large as a deer it is formidable. TCH Comment: This area of Texas is Big Thicket Country. The belief in large black panthers in this part of the state is almost 100%. To most folks living in this part of Texas long-tailed black cats are just part of the local fauna. Not that unusual at all. TCH Comments: It is interesting that the witness states matter-of-factly that the black cats his grandfather saw were cougars. The cougar sighting is interesting as well. The witness is quite correct in that Cherokee County is not thought to have resident mountain lions by state wildlife officials. The wolf sighting claim is interesting, too. While not as common, I’ve had several reports of wolves in the eastern part of Texas recently. TCH Comment: This report originates from an area known more for rattlesnakes than big cats, though cougar sightings here are not unusual. This report is interesting in that it points toward a historical presence of these animals in the area. If the witness who wrote in is reading this now please know I’d love to see the photos you took of the paw prints. As you can see, the reports continue to come in unabated. My site seems to be one of the few places people who see large black cats have to report what they’ve seen without having to worry about receiving a lecture on what is real and what is not in the animal kingdom. I do believe I have now accumulated enough data, admittedly anecdotal in nature, to start trying to identify some patterns. More on that soon. In the meantime, please continue to contact me regarding sightings of these black cats. Your report might just be the one that leads to discovery and documentation. 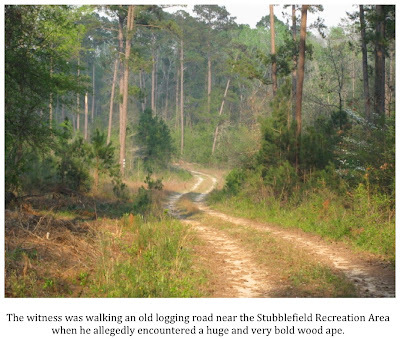 A couple of weeks ago I made a trip to East Texas to interview a gentleman who claims to have had a rather intense encounter with a wood ape back in 1983. While the incident was not recent, I was very interested in speaking to this witness due to his job and where he lived. I think you’ll understand what I’m talking about once you read the account below. It turns out the report featured a unique detail that I’ve never come across before in my decade, or so, of investigating the wood ape phenomenon. 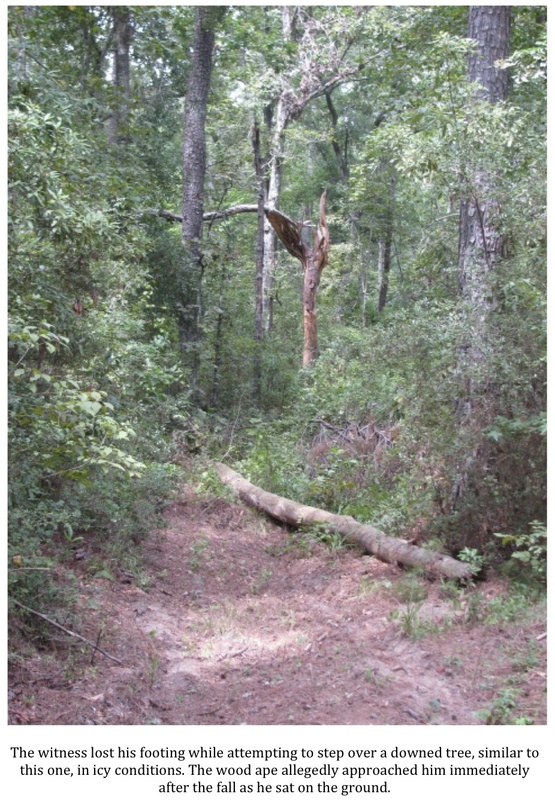 This investigation was conducted as a result of an incident that allegedly occurred in Walker County, Texas, in the Sam Houston National Forest, 20 December 1983. The witness is a camp host at one of the improved campgrounds located in the Sam Houston National Forest. He has hunted the SHNF regularly since 1966. NAWAC Associate Member Dave Dion met the witness while staying in his campground. While there, Dion decided to engage the host in conversation and asked him flatly, “Have you ever seen anything strange out here?” The witness replied quickly and without hesitation, “You mean one of those woods apes?” The pair went on to have a lively conversation in which the host related several odd events that he had experienced over his more than four decades of hunting the SHNF. Dion contacted me and a formal interview with the witness was arranged. The host related the same events that he had shared with Dion to me. The most intriguing account, and the only one which involved a visual, is related below. The witness told me that he had always wanted to hunt in the snow. As a Texan, he had few opportunities to do so but on December 20, 1983 he finally got his chance. It was a very cold day. The night before had brought sleet and snow flurries which had created a very light dusting of white on the ground. The witness decided to hunt an area East of the Stubblefield Recreation Area. He had been walking for about 15 minutes on an old logging road when he heard something move off to his left. He turned to look and spotted an animal of some kind in the underbrush. The animal was a reddish brown and seemed to be hunkered down as if trying not to be seen. The witness had his rifle slung on his shoulder and decided to glass the animal in the hope of identifying it. He glanced down briefly to bring his rifle up to the high ready position; however, in the short interim in which he had taken his eyes off the animal it had disappeared. The witness didn’t think too much of the incident and continued on his way. He had only walked 50 yards, or so, when he heard a large limb snap to his left. He wheeled around to catch a glimpse of something upright approximately 90 yards away. The upright figure was partially obscured but the witness was able to get a fairly good look, as much of the underbrush was not green at the time. Again, the witness swung his rifle up in order to glass the subject. Unfortunately, the result was the same. The figure was gone and despite waiting and looking for several minutes the witness was unable to get another look at it. When asked to describe the upright figure, the witness said it was very big, very tall, and very wide. He said it was the same reddish-brown color as the first animal he had seen. When asked if he thought it was the same animal the witness said he could not be sure but felt it was likely. The witness was now mildly disturbed by these events but decided to continue to his hunting spot. He continued to ponder the events of the last half hour as he walked and decide he must have seen a bear. He knew there were not supposed to be any bears in East Texas anymore but had heard stories from hunting buddies and acquaintances from time to time relating bear sightings in the region. The bear theory fit, he thought, as the first visual was of an animal down low to the ground and the second, assuming it was the same animal, was upright. "What other animal could stand up like that?" he asked me. Also, he knew that black bears could be reddish-cinnamon in color. Satisfied, and feeling a bit more relaxed after coming to this conclusion, he walked on. He had trudged on another 100 yards, or so, when he encountered a large tree that had fallen across the logging road. While holding his weapon in the low ready position (he had decided not to sling the weapon again), he went to step over the tree. His lead foot slipped on an icy spot and he fell hard on his backside. He said he cursed loudly and had begun gathering himself to get up when he heard something big approaching his position from his left. The witness sat stunned as a huge, hair-covered, bipedal figure walked from the woods on his left directly toward his location. He watched the creature cover 20-25 yards very quickly and smoothly. The animal stopped just behind several small trees on the edge of the logging road. As the witness sat amazed, the animal pushed two trees apart and stepped into the gap. No farther than 10 yards away, the animal’s hands remained on the trees as it leered at the witness and huffed/grunted twice. The animal then stepped back, released the trees, which snapped back into place, turned and walked back toward the woods. The witness said it never looked back once it turned to leave. “It seemed very confident that I was no threat,” he said. The witness described the animal as absolutely huge. He compared it to the overall size of a Kodiak brown bear “only upright.” He estimated the creature stood between 7 and 8 feet tall. The animal was covered in hair from head to toe. He could not recall seeing anything that might identify the creature a male or female such as breasts or genitalia. He did state that the animal did not appear to have a neck and the arms were very, very thick. The witness was struck by the sheer amount of air that the creature exhaled as it huffed/grunted at him. He could see the vapor pour from the creature’s mouth due to the extremely cold temperatures that day; so much so, that it obscured the animal’s face for a couple of seconds before dissipating. When asked if he could describe the subject’s face in more detail, the witness again noted how hairy it appeared. He said, “There was no skin showing like on a gorilla’s face; just hair.” He noted that the hair below the nose and around the mouth was white from ice that had formed due to the cold temperatures. “It looked kinda like how some of those football players with beards get up in Green Bay and places like that,” he said. The witness then added that the eyes of the animal were huge. He struggled to come up with something the right size to which he could compare the eyes. I offered up the example of one of those old football shaped coin purses that you would squeeze at the ends to open. He said he knew exactly what I was talking about an that the eyes weren’t quite that big but not too much smaller. He then added that eyes were a “bright aqua-marine” color. When asked if he was sure about the color, he remained adamant that they were a very light bluish-green. The description of the creature’s eyes being a light aqua-marine color is something unique that I have not come across before. I admit to being a bit troubled by this detail. I have considered the possibility that the witness observed some sort of reflected bluish eye-shine due to the snow and ice on the ground that day but do not find that possible explanation particularly satisfying. I’ve discussed the matter at length with some of my fellow NAWAC members. None of them have ever heard a witness claim a wood ape had anything but dark eyes. Many opinions and possibilities were bandied about. Could the ape have had cataracts? Maybe the witness caught some sort of daylight eye-shine? My previously mentioned theory on the color having something to do with light reflecting off of snow or ice was brought up as well. In the end, we were all left scratching our heads. 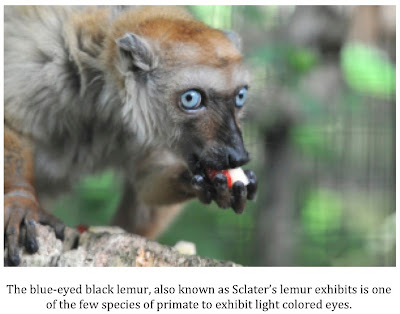 While it is true that none of the other great apes (gorillas, chimpanzees, orangutans and bonobos) have light colored eyes, other primates do- Sclater’s Lemurs (Eulemur flavifrons) being one such example. Homo Sapiens also exhibit light colored eyes thanks to a mutation that occurred roughly 10,000 years ago. If such a mutation could occur in us then why couldn’t it occur in another large primate species? The witness is quite a colorful individual who was very open and straightforward in his recounting of the events of 20 December 1983. Fellow NAWAC member Dave Dion was present for this interview and told me that there were no discrepancies between what the witness originally told him and the account he gave me. I did not detect any signs of deception on the part of the witness. In fact, I saw goose bumps rise up on his forearms as he recounted the events of 30 years ago. He remains rattled by the experience even now. I am convinced that he saw something for which he has no explanation. 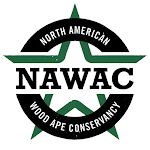 The NAWAC continues to collect and investigate reports of encounters, both contemporary and historical, with strange, bipedal ape-like creatures in Walker County and surrounding Big Thicket Counties. 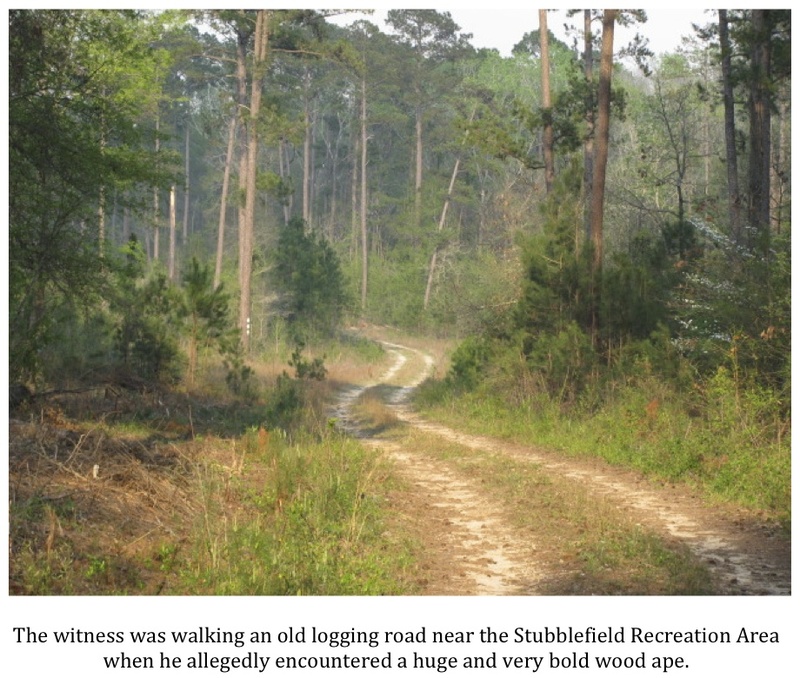 This part of southeast Texas continues to make up the most prolific region in the four-state area for reports of encounters with creatures fitting the traditional description of the sasquatch or wood ape. Well, there you have it. To be totally honest, this report has befuddled me. Nothing the witness told me as far as the creature’s behavior gave me any pause. While an ape approaching a human so boldly is atypical based on my experiences, it is not unprecedented. The witness was very convincing. The blue eyes reported continue to gnaw at me, however. I simply don’t know what to think about this. I guess, it is what it is and no more. I would be curious to hear opinions and comments (keep it civil) regarding this report. I would also be grateful to hear of any other accounts where alleged wood ape witnesses reported light colored eyes.